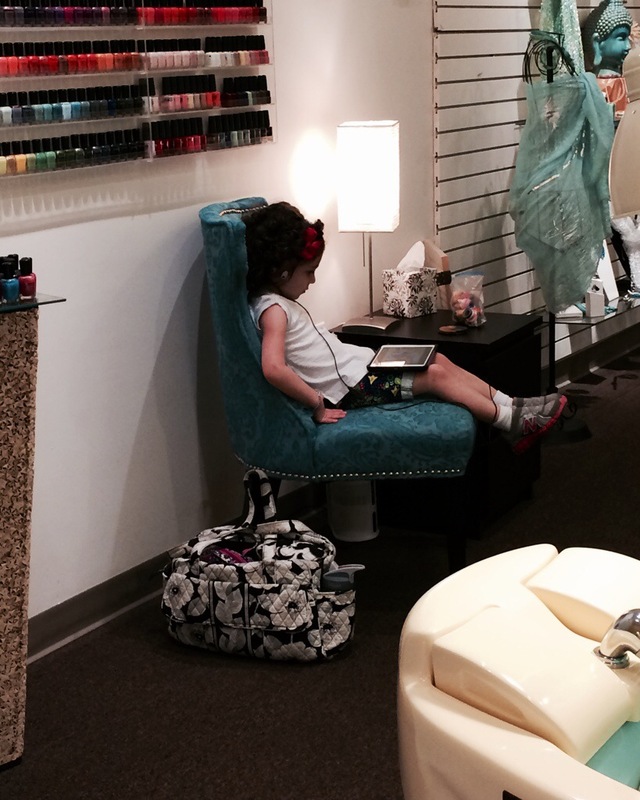 No mani/pedi for the toddler. We should’ve been at home eating lunch, but instead I took her for pizza before we arrived. She should be playing with her toys. After all, she had a therapy (i.e., OT & speech) double-header this morning. She should be going down for a nap by 2:00. But instead we are at the nail salon because I desperately need a manicure and pedicure for my cousin’s wedding. I’m using an iPad Mini to babysit my daughter as my nails get cut, sculpted, & painted. She’s going to watch 90 minutes of “Daniel Tiger’s Neighborhood” in all so I can feel like a more put-together version of myself this weekend. My husband said doing taking Isabelle is okay, but I still feel odd about this because there are better things she could be doing with her time right now. But mommy deserves a little pampering every now and then, right? I’m jealous that she’ll sit and wait for you. My three year old probably wouldn’t. I predict she’ll grow to be a “wild reader”. In 5 years that iPad will be a book and she won’t stop reading long enough to even notice what colour polish you choose. This is probably a relaxing activity for her after all her hard work this morning. Hope she’ll be a wild reader. Definitely don’t want her to be plugged-in like this. However, she’d never sit without the iPad! Daniel Tiger’s Neighborhood is quality entertainment! I think she’ll be happy, and you are too. So it’s all good. My three are all grown now but they turned out wonderfully in spite of the fact that I was still quite young when I had them and not always the most mature person. BTW I am visiting from the Slice of Life Prompt. I love this slice, because it’s so true. I did my run this morning with all my kids…because I had to. It is soooo hard to fit everything in! My children aren’t quiet sit there kids either – if I took them to the salon, I’d need to plug them into a device as well. Have a great time at the wedding! Don’t you dare feel guilty! You are raising a wonderfully literate, well rounded young lady there! I am at work and my middle son is on his device. This is the “sometimes” life of a professional Mom that they will one day grow up to be extremely proud of and grateful for. And you make sure that you look down at those toes and smile every time you do! You completely deserve a little pampering, and I have no doubt that Isabelle will be a reader and writer, despite some iPad entertainment. We used to call Barney the great big purple babysitter in our house. Sometimes, we all need a break and mani/pedis rock! There is NO shame here Stacey. I’m sure she had a blast and your toes look great. We have to be creative sometimes. It’s okay, Stacey. She actually might have learned something, too, & you had a lovely time for yourself. Good for you! I think you are being a role model actually. Salon visits help her to know it is important to take time to look after yourself, especially to put in extra effort for special occasions. I say just enjoy whilst you both soak in all that ‘girliness’ together and she is WITH you!! Two exclamations marks. I like the title you chose. I don’t think you have a thing to worry about when you have that perspective. Julie’s right: everything in moderation. Isabella seems perfectly content to watch her show, and I know you felt better after a little pampering! Enjoy the wedding! You are an amazing mom. You need some time for you, and it is good for Isabelle to see you taking that time. She is learning something even while you get your mani pedi. Happy wedding weekend.